A short time ago my PS3 died. It was a sad day. I tried to bring it back to life, but was unsuccessful. My wife then surprised me BEFORE Christmas with a PS4 and Fallout 4 (Best wife ever!). I've been a wasteland wanderer just trying to survive ever since. It does bite rocks that moving from PS3 to PS4 means that you have to start from scratch with games. Still, starting over can be exciting... There are enough places to sell / exchange old games so that upgrading doesn't leave you empty handed. In my case, I've had so much fun with fighting off the zombie like ghouls and crazed raiders that i haven't worried about how many games i had or lost. What system do you play? What's your current gaming obsession? Years ago, one of the first comic book titles I collected was Marvel’s WHAT IF series. How they changed outcomes or had characters make other choices that affected their lives. I loved how the writers took established characters and flipped the script on them. When I began reading DC Comics, this love increased exponentially. DC had the multiverse, countless alternate universes with characters whose lives changed while seemingly slightly…ended up monumental. Elseworlds stories have for the most part been awesome. Stories Superman Red Sun, The Nail, Flashpoint, The Dark Knight Returns, and Kingdom Come are just a few titles that came from our favored heroes choosing the other option or fate taking another path and those choices made for epic stories. 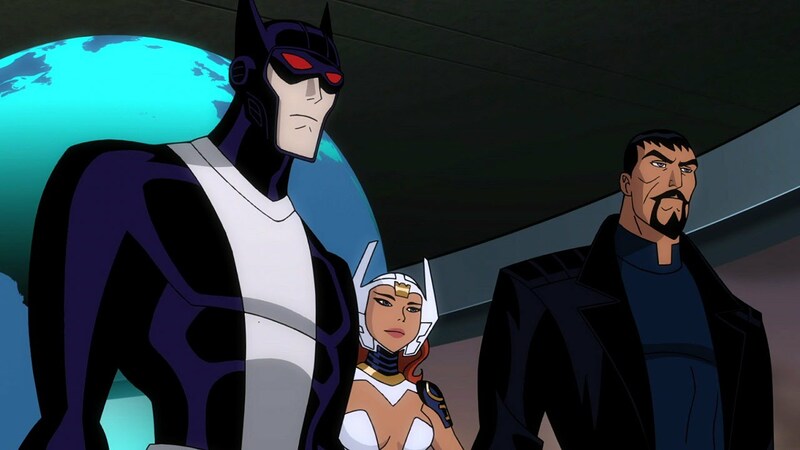 Justice League: Gods and Monsters was an equally impressive addition to the Elseworlds fiction. The animation for the feature was well done and was fine for telling the story. While DC Animation has yet to disappoint me with the art from their projects, the involvement of Bruce Timm (creator of Batman: The Animated Series) was apparent. Reimagining DC Comics trinity (Superman, Wonder Woman, and Batman) made for an interesting tale. I really enjoyed how other heroes and villains are present in this reality, but are on the cusp of getting their powers. One of the best parts of watching the feature was looking at characters and figuring out which hero or villain they were destined to become. We see glimpses of Cyborg, The Atom, and Mr. Freeze to name a few. There were a few names that were dropped that I didn't recognize and had to look up after the movie. Fed right into my nerd nerve....I think I had a few nerdgasms during the flick and for sure at least one afterwards. I liked the villain of the story as well. It’s often said that DC comics has the most interesting bad guys. Whether you figured out who the big bad was early in the film or if you didn't see it coming; the villain worked well for the story. You're almost meant to think Lex Luthor is the antagonist, but that's a little too obvious. Will Magnus and his Metal Men was an intriguing villain in motivation as well as action. Perhaps the best part of Justice League: Gods and Monsters isn’t the art or the story but the fact that like the Elseworld stories Kingdom Come and the Dark Knight Returns… the Gods and Monsters universe isn’t stopping with the single feature film. Prior to the animated release there were three online short episodes that featured each of the main characters (Gods and Monsters Chronicles). I watched each one and they were well done…cool, interesting, and each gives a brief look at each characters personality. There are several follow up comic books being published as well as an action figure line. 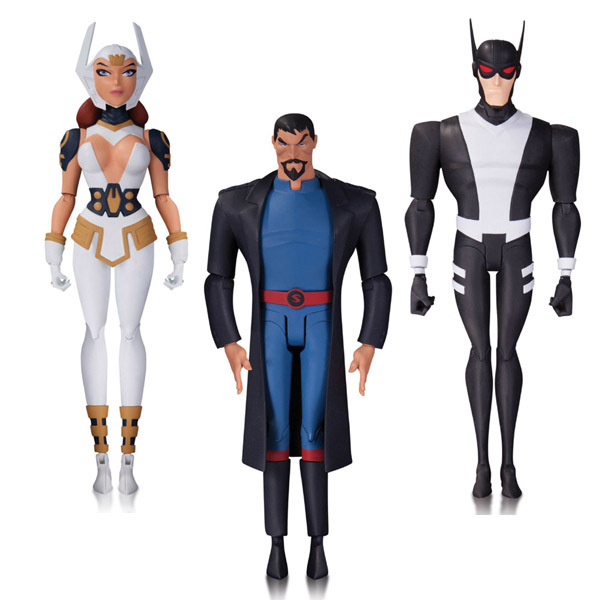 For Justice League: Gods and Monsters, the future continues to look bright. With all the follow through and follow up on the universe through various media, I give the flick a solid A. It’s a must see for any DC comics, DC animation, and general super hero fans. 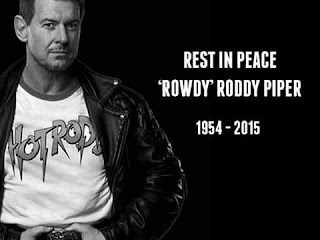 Rowdy Roddy Piper died July 31, 2015. It was reported that he passed on in his sleep from a heart attack. Born Roderick George Toombs in Canada, he begain his professional wrestling career at 15. Throughout the 80s, although Piper was a "villain/heel" he had always managed to be a fan favorite. It has been said that Piper made a bigger impact on wrestling and WWE outside the ring with his colorful commentary Piper's Pit. WWE named Piper the greastest villain in wrestling history and was inducted into the WWE Hall of Fame in 2005. Piper not only dealt with injuries as all professional wrestlers do, he also had a bout with cancer. Roddy was involved in wrestlling on and off again just about until his death. While most will remember the professional wrestling WWE Hall of Famer as 'Hot Rod', he also acted in a slew of films and TV shows. My favorite and cult classic being the John Carpenter film THEY LIVE which Piper was the lead. I had to make a deal with my wife to see Ant-Man on the Thursday before its official release. But alas that is the life of a nerd dad. Ok, maybe I’m laying it on a bit thick, but the deal was way worth it...Still I digress. If you are a super hero fanatic like myself, you'll enjoy this movie. The special effects are well done. The shrinking and growing scenes are cool and believable. The CGI ants were also cool. My wife was actually surprised by the number of ants in the ANT-MAN movie…lol. There were a few times that the shrinking scenes were a little hard to follow, but I'm sure it'll be fine the second time I see it. Michael Douglas and Paul Rudd do a good job of portraying our heroes. The torch passing between the two works well on screen. Former Lost hottie Evangline Lilly was cool as Hope. At first I thought her character was too rigid, but she warms up later. As expected with a Marvel movie, the weakest part of the film is the villain. While Corey Stoll is ok, it’s like he can’t make up his mind whether he was nefarious, psychotic, or simply misunderstood. While that might work with say the Joker, it makes Stoll’s motives seem more manufactured. Besides Rudds’ wisecracks and humor, there is the "plucky comedy relief" from what equates to sidekicks; in the form of Michael Pena, T.I., and David Dastmalchian. Their roles are funny and well placed. Pena is especially fun with his unique method of explaining things to our hero. What makes this film especially good for me is the reason that I have a soft spot for all the Disney/Marvel super hero films...the Marvel Cinematic Universe! The fact that the films are connected and you get cameos and mentions of events from other films tickles my super hero loving bones. Some of the things they mentioned (nods and connections to other Marvel characters and movies) in the film almost gave me a nerdgasm. Then there are the cameos, and those actually did give me a several nerdgasms. There are TWO post credit scenes, so make sure you stay for both. 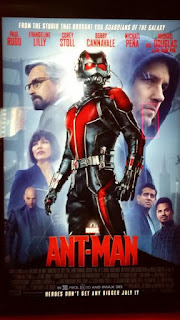 Ant-Man is a must see for the super hero/comic lover, the Disney film lover, and everyone in between. 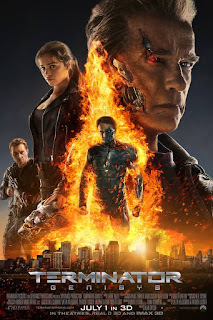 It’s been a few weeks since the release of Terminator: Genisys and I just had the chance to see it. I’ve seen several reviews and caught a comment or two online that mentioned boycotting Terminator. Either way, I was determined to see this film. I guess I felt I owed something to the memories I had growing up with the first two Terminator films. Besides, I figured no matter what happens in this reboot of the Terminator franchise; it couldn’t be any worse than the third Terminator film. Terminator: Rise of the Machines left such a bad taste in my mouth compared to two prior films that I hadn’t even thought about seeing the fourth installment of the franchise until I decided to write this article. The premise of the film deals with an alternate timeline that begins the moment that Kyle Reese was sent back in time to save Sarah Connor. Skynet intercepts John Connor afterwards and causes the alternate timeline; thus justifying to us nerds a reason for the reboot, different actors and such. 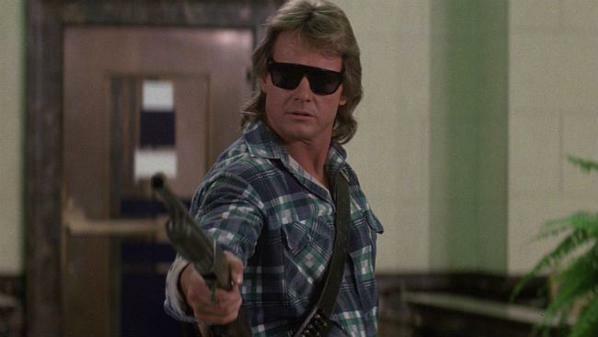 Still, you can’t have a good Terminator film without Arnold. And he was true to his word; for Genisys, he came back. Honestly, I was more satisfied with Genisys than I thought I’d be. Still, I wouldn’t rank Genisys over T2 if I was making a list. I warn anyone who is a fan of the Terminator franchise and is planning to see Genisys not to fall into the trap of comparing the Sarah Connor and Kyle Reese characters from the first two films and the current one. While the characters managed to have similarities, I believe Genisys did a decent job of NOT trying to modernize or imitate the original characters. The special effects were done well, especially the new big bad, the T-3000. It was nerdtastic to see the nods that were put in to the former films; such as the police chase with Reese after his arrival, the T-1000, even the classic “come with me if you want to live” line. Seeing “the mother of dragons” Emilia Clarke play Sarah Connor was cool. Emilia was not the scared waitress running for her life that we’d seen before. She had this hard to describe cuteness while still being able to kick arse. I lost some nerd cred though as my buddy had to tell me after the movie that Daenerys Targaryen was the mother of John Conner. I liked Arnold as “Pops”, the guardian cyborg. He had enough “unintentional sarcasm” as the father figure without emotions and that made him work. We get more character development I’d say from Reese in Genisys, Jai Courtney did a fair job in his portrayal. I did have an issue with John Conner played by Jason Clarke. While the effects surrounding Clarke as the T-3000 were awesome, it was the character of John Conner that left me wanting. While I know it’s a nitpick, his battle scarred face seemed a bit over the top and unnecessary. While I can’t put my finger on it, something was lacking with his performance whether it was his dialog or his body language. And if we didn’t get enough nerdgasms from the film, Matt Smith, that’s right Whovians, The Doctor makes an appearance. In all, Terminator: Genisys was a decent film. I would suggest any Terminator fan should give it a chance. The effects, the nods, and performances were good as a whole. I did have issues with a few things in the plot. The heroes go back to the day before Genisys aka Skynet was about to be “born”. If you have a time machine, why not a week or a month? If it’s that important, the life or death of the planet, why put it to chance for a single day, like Pops said, “traffic”? Speaking of “Pops”, he had been preparing for the day for years and all he had was a room full of guns and explosives. Seems like he could’ve done something else. John Conner kills a security guard after saying he can’t have any witnesses… witnesses for what? You’re about to nuke the planet…who cares if this guy lives for a few more minutes, he would’ve died later anyway. After the detonator is destroyed, our heroes activate the non-functional time machine and it just happens to explode and detonate the planted explosives. It wasn’t clear by any stretch that in the last few minutes before Skynet’s awakening that the machine would explode and solve their no detonator issue. While I don’t want to compare the films, over 10 years ago when I walked out of the theatre after seeing T2; I was excited and in awe. I still have vivid memories of the film to this day. Unfortunately even with nitpicks aside, I don’t see that happening for Terminator: Genisys. It was a good film that missed the mark on being a great one. It's been a while since I've written anything and I can't think of a better topic to start with than Spider-Man appearing in Captain America 3: Civil War. I'm almost proud of Disney and Sony getting together to make this happen. Ten or fifteen years ago, I wouldn't have seen a collaboration like this. It's too bad that Disney couldn't do something similar with Fox and get some use out of Wolvie and the X-men. Speaking of missed opportunities though, casting Tom Holland as Spider-Man just seems like such a waste. I'm sure the guy is going to do a fine job, but there was a chance to go with the Miles Morales Spider-Man instead of the same ol' Peter Parker Webhead. As Marvel and Sony are two different entities, the chance to deal with characters from an alternate universe was as ripe as Georgia peach for the picking. I can understand why it didn't happen. With all the risks that Marvel took beginning with Iron-Man back in 2008 and then with Guardians of the Galaxy in 2014, am I wrong to have expected a little more? When the rumors of a possible Miles Morales appearance in the Marvel Cinematic Universe started, I nearly went crazy with excitement and anticipation. It wasn't the "oohh we get a Black Spidey now" kind of excitement as some might expect from a BLERD. I'm one of the first guys to agree that I'd rather have quality new characters instead of minority rehashes of established ones. I'll take a good Night Thrasher over a 'Black' Batman. It was more so the "WOW! Here we are going into uncharted waters again with Marvel" They made a talking raccoon playing nice with a walking stick work well...now this? I can't help but be a little disappointed. Civil War is going to be awesome nonetheless. All I need do is look at The Winter Soldier film. That was arguably the best follow up flick that Marvel has done...I shudder to say that Disney has done as well. As a nerd dad that loves comics... specifically superheroes, I love sitting back after a long day and putting the kids to bed to watch a little of the tele. Now more than ever the small screen has been bursting with programming to make a nerd guy like myself swoon. We have the CW aka DC network that had Arrow and The Flash. Both shows are in the same continuity and they've already had the first show to show crossover. I think I heard nerdgasms from the neighborhood during the commercials. Decent characters, stunts, and special effects make both these show a must. I've always loved The Flash's ROGUES gallery...specifically the group "The Rogues" Captain Cold has already been introduced and in the episodes to come in the next week or so, we're going to get Heat Wave as well. Even Firestorm paid the Flash a visit. OH JOY! Arrow has had to deal with Deathstroke, the (Ray Palmer) Atom, Soloman Grundy, Ras al Ghul, and the Suicide Squad. While some of the direction has been OK..for the most part the show is impressive. Next we have ABC and the Agents of SHIELD. This show has continuity with the Marvel movies. So it was awesome seeing the show deal with the aftermath of Thor 2 and Captain America 2. We haven't had a Avenger cameo on the show, but we did get ol' one eye himself Nick Fury. A few other cameos include Sif, Absorbing Man, Blackout, and Deathlok, The focus of the show is Agent Coulson, a fan favorite from the Marvel movies. Recently Agent Carter debuted. This is a pre-Shield 1940s show that features our favorite femme fatale from the Captain America movie Peggy Carter dealing with bad guys while also dealing with sexism from her coworkers. The show isn't bad on the visuals and Peggy plays off of Jarvis (Howard Stark's butler) pretty well. NBC has Constantine. The show is based more off the comic Hellblazer than the movie with Keanu Reeves. I've never read the comic, but I like the show. The characters are interesting and the monster of the week model works for it. Still there are a few serial threats and reoccurring characters. There is a lot of talk about cancellation due to ratings. If you haven't seen it, its worth at least one view. Fox has had a hit with Gotham. A prequelesque version of Batman that focuses on Jim Gordon's life as a Gotham city cop. The show is peppered with cameos of Bat villains the biggest to date being the Penguin. The show is interesting but it has often left me feeling that Gordon's fight against the corrupt Gotham system is all but futile. Still I like Gordon and Bullock enough to stay along for the ride. AMC still has The Walking Dead going strong for another season. Not a superhero show, but who doesn't love the zombie apocalypse? The characters from the pages of Robert Kirkman's comic have become real to many people. Plus we get the Nerdist Chris Hardwick's snappy commentary on the after-show the Talking Dead. If this wasn't enough there are a host of shows on the horizon. Netflix will be hosting a few Marvel properties. We have Daredevil coming soon. And following that we have Luke Cage and Iron Fist as well. After these shows, we'll get a show called Defenders that will unite them all. This is a push for some more street level super heroes. I am definitely looking forward to it. There are a Super-girl, Teen Titans, Powers, and Walking Dead spin off in the works. In addition to a possible Xmen show. There are also other show that are sci-fi or fantasy based going strong on several different networks.